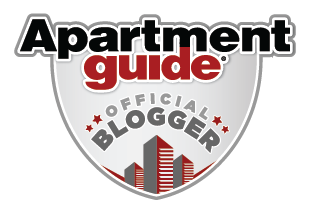 You may recall that for the next couple of months I'm partnering with Apartment Guide as an official Apartment Guide Decor Blogger. And as an official Apartment Guide Decor blogger, I'm going to share ideas for making the most of your space on a budget. I hope that you all will join me on this bloggy journey as I share my go-to tips for creating your dream space without breaking the bank. 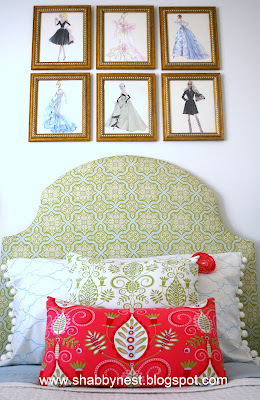 One of the main reasons I started this blog was to share my ideas for decorating on a budget. Let's face it. With the sheer number of times I "tweak" a space, I could drive myself into financial oblivion if I didn't find frugal ways to decorate. I've found that the best way to decorate frugally is to think outside the box a little bit. Being creative in my approach to home decor definitely helps stretch my tight decorating budget. And today I wanted to share 6 tips with you on ways to stretch your decorating dollar. 1. Go neutral - mostly. Okay, so this might not be the most creative suggestion, but it will definitely benefit your wallet and it creates the basis for the other more creative ideas I'm going to share. When investing in large pieces for you home, choose neutral colors. That bold print sofa might be appealing - very appealing - but investing in the neutral sofa will allow for longer use...and adding pattern can be accomplished easily (and less expensively) with accessories. 3. Make your own pillows. As I mentioned in tip #1, accessories are the easiest way to inject color and pattern into a space. And pillows are one of the best accessories to accomplish that function. Find some great seasonal placemats and sew two together to create a pillow. Sewing together colorful napkins is another super-easy way to create your own pillows on a dime. 4. Give a bookcase a custom look. Find an inexpensive bookcase, and liven it up with a coat of paint. Then use wallpaper, wrapping paper, or scrapbook paper to cover the back and give the bookcase a colorful facelift. 5. Try mismatched seating. Don't worry if you can't afford a dining set. Mismatched seating is very popular at the moment and is a great way to add personality to your space as well. Purchase several inexpensive chairs to use at your dining table...then freshen them up with paint. Using the same color on all the chairs will unify them...or you can play up their differences by painting each one a different color. Either way, you'll have a one of a kind look for your space. 6. Mix and Match. Can't afford a matching sofa and loveseat/chair? No worries. Mix and match. Nobody wants a room to be too matchy matchy anyway. You can even combine different patterns in a single room...the key is to make sure that the colors in the patterns are similar. You probably don't want to combine purple and yellow stripes with an orange and green floral, but a blue and white stripe will go nicely with a floral or a plaid that incorporates the same color blue. Don't let your lack of a budget make you think that you can't make your decorating dreams come true. Try thinking creatively instead and make those constraints work in your favor by coming up with unique and different solutions to your decor challenges. You'll find that your space will be uniquely you without breaking the bank. “Like” Apartment Guide on Facebook at Facebook.com/apartmentguide, follow them on Twitter @AptGuideand “circle” them on Google+for real-time tips and updates on making the most of your space and living on a budget. Whether you're living, looking or moving, Apartment Guide offers how-to tips for making the most of a space on a budget on http://www.movingtoday.comand http://www.apartmentguide.com/blog/. Thank you so much for the great tips! I really appreciate it. Great tips! I'm a big believer in making your own art and pillows. It's so easy to get a nice bang for your buck that way. Thanks for sharing. Mix and match- just gotta love that! Apartment renters of apartment homes like New Bedford Apartments can definitely make more interesting apartment decors if they mix and match their accessories. They can also recycle some items and make use of them as accessories so they don't have to buy every now and then.